How is entering graduate school like becoming an apprentice? When I was an undergraduate at Reed College I studied the history and literature of renaissance and mediaeval Europe on the side while earning my BA in Psychology. I realized then how the mediaeval system of turning an apprentice into a master is a near perfect analogy for the transformation of any layman into a specialist through our modern educational system. In the mediaeval, renaissance, and enlightenment eras (before industrialization) skill-based and intellectual professions were acquired by apprenticeship. A master took on apprentices and would teach them the craft and provide room and board in exchange for their labor. Sometimes families paid the master for their children’s apprenticeship if there was enough demand for it. Sometimes children of nobility, gentry, or the very upper-middle class would receive tutoring or attend grammar school in language, history, arts, and the like not to become masters themselves but to become well-rounded — also in exchange for pay. William Shakespeare serves as an example of an English Renaissance middle-class education — he is believed to have attended King Edward IV Grammar School until he was 14 years old. Whereas the ideal for a gentleman’s education in Italy was described by Baldassare Castiglioni, who wrote at length about the importance of being competent in several areas in his Book of the Courtier by the age of 27. I came to understand that this is where our modern ideal of a well-rounded education in high school and undergraduate school came from. If a boy was younger son of a very well-to-do father and didn’t stand to inherit, he might attend university and focus on one profession like medicine, religion, or law and become a “doctor”. This is where PhDs (medical doctors and doctors of philosophy) came from. Only the very wealthy could afford the time to learn a trade as specialized as medicine or law or instruct at a university. Yet for most of the middle class education was very specifically focused on teaching crafts and services to be used in employment and in association with guilds. Once an apprentice proved himself with his skill-craft, he graduated to journeyman. Journeymen often worked for their master but collected wages, lived separately, and began their own families; or they traveled to establish their own shop (as the term “journey man” implies). Only when the journeyman was accepted by a guild and took on apprentices was he considered a master in his own right. Matt Might aptly represents the layers of education towards gaining a PhD (doctorate in philosophy). Notice the pink circle surrounding the green one and juts out a little to the side? That’s the Bachelor’s degree. An undergraduate, like I was, studies a wide variety of topics but majors in one particular area. Today’s range and degree of undergraduate education is different from mediaeval tutoring only in that it has a specialization at all. The master’s degree (dark pink) is built upon this slight specialization with further focus. 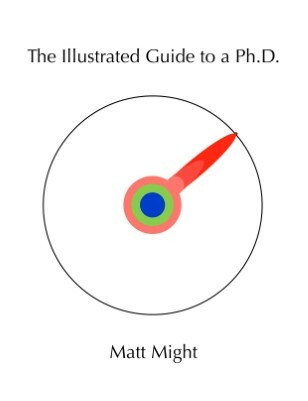 Finally the PhD (red), which with his unique discovery, punctures through the known threshold of knowledge — thus making him an expert in his field among experts. Each of the outer layers builds upon the last, more general knowledge. Right up until that last dent through the frontier of discovery, every layer is gained through schooling and mentorship with increasing autonomy and focus. In my case, I had a well-rounded education in history and literature, language, the hard sciences, a touch of philosophy and the arts, a dash of physical education, and my major in Psychology (what some call a “soft science”) by the time I’d gained my BA (Bachelor of Arts). I felt like one of those fortunate few who were educated by many different tutors and fashioned into a well-rounded student. Of course, I also had to make a living, so I had a focus and needed to find a master to give me work in a lab. Much like an apprentice, I obtained employment and exchanged my labor to be in the same “shop” as a master (“established” PhD) and her journeymen to acquire skills and the good recommendation of my superiors. I picked up on the vibe that the apprentices like me would someday go on to graduate school, gain our PhDs, and make our mark on the world. However, we were warned that many many of those with PhDs but are not “established” remain there (like journeymen never accepted into the guild, always serving a master) never to obtain the funding necessary to set up their own labs and get tenure or grants and have to assist with the studies created by those who do get the funding. Once published (starting with our dissertations), we would have to keep publishing until (and beyond) the point when we would be “established” as masters in our own rights. That’s why they say “publish or perish” in academia. Now, I’m focusing my expertise on illustration, and the analogy is somewhat different when applied to this field. While the sciences require certain skills, they are institutions based on knowledge. They are more like the old medieval universities of law, medicine, and religion which required a great deal of schooling as well as mentorship dolloped on for good measure. If one chooses to practice medicine, therapy, or psychiatry (a combination of the two) this requires yet more skill and thus more mentorship and a longer period as a “journeyman”. However the arts, while requiring certain knowledge, are institutions based on skill and the emphasis is more on mentorship. A student is first schooled in the masters before developing his own style and specialization. Apprentice = MFA student prior to midpoint review and internships (roughly three semesters)* or a student of one or more masters. Journeyman = MFA student prior to graduation* and/or prior employment or building a client base. Outside of the educational system, apprentice and journeymen are separated only by skill level and regard by the artistic community. *In the artistic field, an MFA isn’t a pre-requisite for employment and mastery (as an MS or PhD is in the sciences) and several experts are very successful without modern degrees. However, many argue that going through art school to gain a degree is a faster way to develop the skills and portfolio necessary to obtain mastery, work, a personal style, and “establishment” in the field. A Master’s degree can also be a pre-requisite for teaching, which is one of the main ways to mentor other and be paid to do so (and achieve “master” status). The analogy isn’t perfect. The stages of apprentice, journeyman, and master don’t map perfectly to the modern stages of expertise. Being an MFA student doesn’t make me a mediaeval apprentice nor a journeyman exactly, and I won’t necessarily be a master by the time I have my…well, Masters in Fine Arts degree. So instead, I will draw the line between apprentice and journeyman midway in my career as an MFA student. Right now, I’m a married adult with my own residence, and yet I don’t have quite the skill to work under the experts yet. I am placing myself in something like an apprenticeship under the masters until the School of Illustration at AAU decides at my midpoint review that I have the skills necessary to carry out my own project. Then I’ll regard myself as something like a journeyman. Not “established” or able to work entirely on my own, but with greater skill and autonomy than an apprentice. When I graduate I’ll be like a journeyman on the road applying to enter a guild, open my shop, and become a mentor. Once I’ve joined a guild like The Society of Illustrators as a full member, receive steady commissions and/or employment, and either teach or offer advice at conceptart.org and other communities, then I’ll consider myself a master. I’ll be logging my journey here and offering an insider’s view of the process. Thank you for reading. If you have any thoughts on this analogy, or your experiences in school or developing your expertise, please feel welcome to comment here.